«Granch MIS» system is a part of the «Smart Mine» ® GORNASS. Developed to automatically measure the parameters of mine atmosphere; control of air dust content; control of the settled dust mass; mining equipment management and control of parameters for ensuring work safety; providing automatic gas and fire protection; providing explosion protection mine areas, degassing pipelines and installations for monitoring forecasting dynamic phenomena; transfer, processing, analysis, storage and display of information; exchange of information with other systems. «Granch MIS» system is used for the underground mines and their ground structures, which are dangerous for gas (methane) and / or combustible dust, in accordance with the Ex marking of the components. to change the number of measuring and control channels during operation. other technological processes, including implying complex control algorithms, data collection, transmission of a large amount of information, etc. «Granch MIS» consists of measuring and control units based on measuring technological equipment controllers Granch SBTC2, sensors, autonomous power supplies, communication lines, routers, servers and workstations. 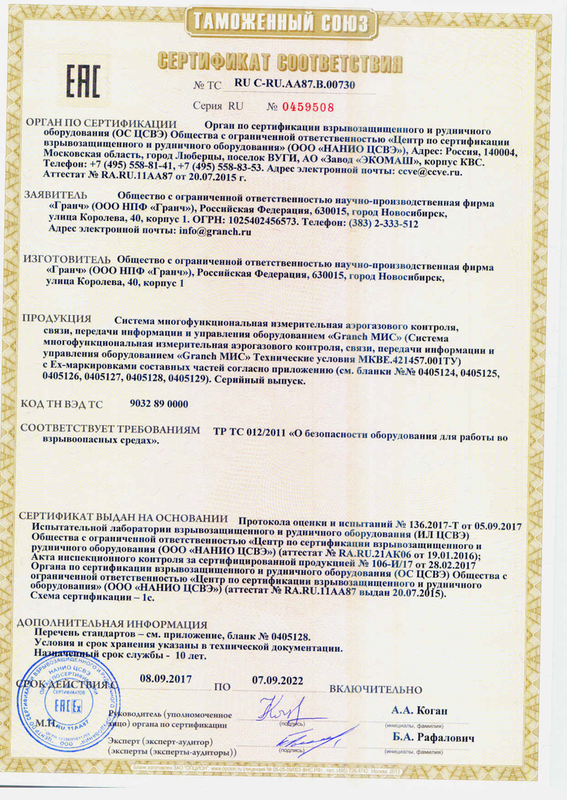 The specific structure of «Granch MIS» is determined by the project.